CITY OF LOST DREAMS. Magnus Flyte (Pseudonym for Meg Howrey & Christina Lynch). Penguin. Cover art courtesy of Penguin. City of Lost Dreams, a Penguin original just-released, is an ambitious novel that promises an action-packed plot and an incisive characters – and then delivers. 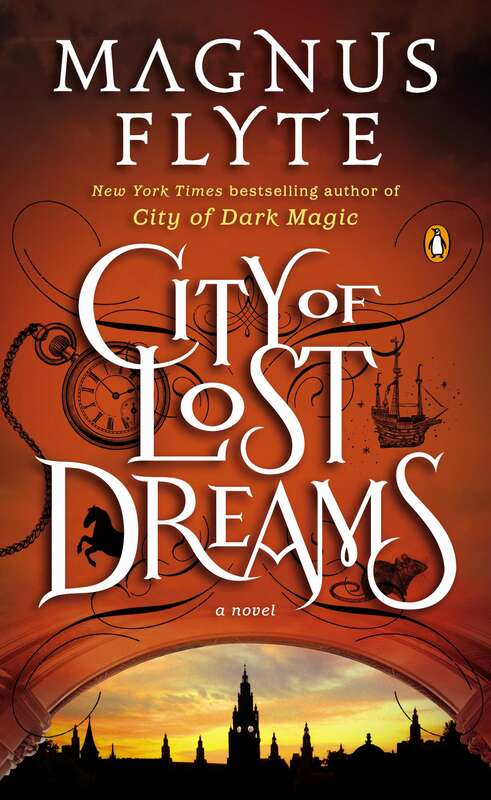 As the sequel to the New York Times bestseller City of Dark Magic, this book has a huge reputation to live up to – the question being, could Magnus Flyte sustain the level of energy necessary to elevate this book to a notable plateau? However, in reality, City of Lost Dreams may in fact be better than its predecessor: these characters more well-rounded, this story a step quicker down the field. In essence, every novelist is challenged by having to create characters that readers want to know, with which they want to develop a paper-fed marriage. And that’s really the strength of the current Magnus Flynt collaboration – the grand cadre of characters, led by Sarah, somehow gets under our collective skin and forces us to take note, to care. And once that occurs, we’re hooked – driven to know, compelled to understand. Throw in a story that tests the human condition’s predilection to surrender to temptation and live outside the law, and you have a book that takes hold by the throat and refuses to let go. This entry was posted on November 22, 2013 by Jacob Aiello in 2013, In the Spotlight, November 2013, Rat On Fiction & Nonfiction and tagged Book Review, Books.